Snow is not a weather condition that many of us normally associate with Africa, but despite this, several African nations regularly see snow each winter. Often, the snow isn't deep enough for extreme sports like skiing and snowboarding; however, there are three countries on the African continent that do have their own ski resorts. In the southern hemisphere winter (June - August), your best bet for some on-piste action is Tiffindell Ski Resort in South Africa, or Afriski Mountain Resort in Lesotho. 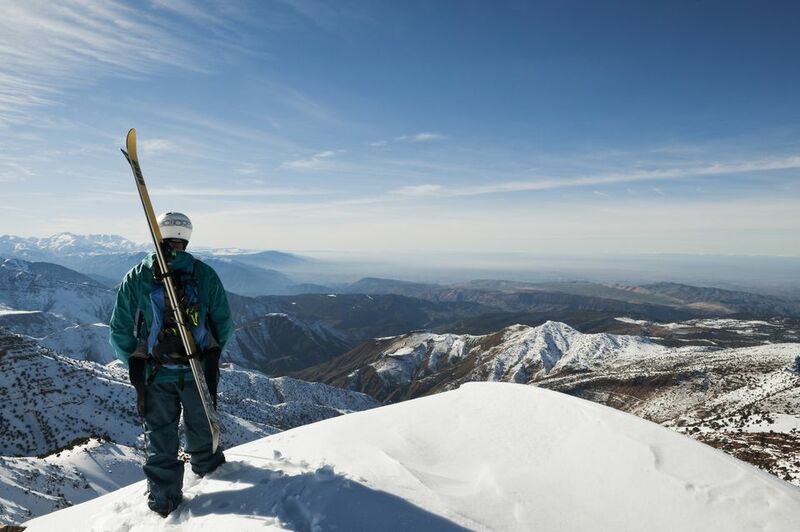 If you'd rather spend the December festive season on the slopes, your only option is Morocco's Atlas Mountains. Skiing in Morocco is nothing like skiing at the high-end resorts of Europe and North America. Depending on where you go, infrastructure is either limited or non-existent - including ski hire outlets, ski lifts and facilities for après-ski entertainment. To avoid disappointment, it's advisable to be as self-sufficient as possible, from catering for yourself to bringing your own equipment. If you come prepared, however, skiing in Morocco can also be hugely rewarding. The scenery is spectacular, the pistes are gloriously uncrowded and the cost is a fraction of what you can expect to spend elsewhere. Most importantly, skiing in Morocco allows you to get off the beaten track and indulge your sense of adventure. The novelty of being able to say that you've carved powder in Africa makes the effort of doing so worthwhile. The picturesque village of Oukaïmeden is located 49 miles/ 78 kilometers south of Marrakesh in the heart of the High Atlas Mountains. The village is perched at 8,530 feet/ 2,600 meters, while the winter sports area clings to the edge of Jebel Attar mountain and has a maximum elevation of 10,603 feet/ 3,232 meters. A single chairlift takes you to the top, where six downhill runs await. Each one is made more challenging by a lack of piste maintenance. There's also a nursery area, a ski school, a family sledging area and a series of intermediate slopes served by four drag lifts. If the latter feel too conventional, you can always hitch a ride to the top of the slope on one of the resort donkeys. The runs are not well signposted, and locals take advantage of tourist confusion by offering unofficial guide services. If you need assistance, it's better to hire an instructor from the ski school as these guides are rarely particularly knowledgeable. There is a ski hire shop offering outdated but serviceable equipment, while unofficial ski hire kiosks offer prehistoric gear for a third of the price. Whichever option you go for, you'll be amazed by how affordable it is to go skiing at Oukaïmeden. A day's official equipment hire costs around $18, while lift passes will set you back approximately $11. In between runs, you can purchase traditional Moroccan street food from a number of locally owned stalls. There is a hotel and restaurant in Oukaïmeden called Hotel Chez Juju, although reports vary as to the quality of the accommodation. Some prefer to make day trips from Marrakesh, or to spend the night at one of the luxury kasbahs nestled in the foothills of the Atlas Mountains. Kasbah Tamadot and Kasbah Angour are excellent options, and both can arrange transport to Oukaïmeden for you. Otherwise, return taxi fares from Marrakesh cost approximately $45. If you have a car, the journey from Marrakesh to Oukaïmeden will take you around two hours. Although Oukaïmeden is Morocco's only true ski resort, the Middle Atlas village of Ifrane is also known for its snowy winters and surprising slopes. Located 40 miles/ 65 kilometers south of both Fez and Meknes, Ifrane is a short taxi ride from Michlifen Ski Station, where a series of easy trails offer a fun day out for beginner and intermediate skiers. There is a ski lift at Michlifen, but it's also possible to hike to the top of the slopes. Bringing your own gear is best if possible, although there are rental shops offering equipment in varying states of repair at the ski station and in Ifrane itself. For serious skiiers, one of the best options is to join a ski tour like the one offered by Pathfinder Travels. Every year, the company arranges an eight-day expedition to the High Atlas Mountains. You'll be based at Refuge Toukbal, located at the foot of Morocco's highest mountain; and spend your days exploring the backcountry skiing opportunities provided by Jebel Toukbal and its surrounding peaks. With an average height of 13,120 feet/ 4,000 meters, these mountains yield a never-ending supply of deep couloirs and stunning open snow fields. This trip is priced at €1,480 per person. The truly adventurous can also hit the slopes with Africa's only heliskiing outfit, Heliski Marrakech. There are two packages to choose from. The first is a 3-day/ 2-night excursion that includes up to four helicopter drops per day on High Atlas slopes measuring 11,480 feet/ 3,500 meters or more in height. The second includes one day of heliskiing and a half day at Oukaïmeden. Whichever package you choose, your meals and accommodation will be provided by luxurious Kasbah Agounsane. Prices start at €950 per person.